So my colleague during the month of June is a traditional Italian living in Montreal. Obviously we chatted during work and he had highly advised me to go to Eataly, because it’s simply amazing. And that it was, and more! I absolutely love this market and it was really only at this point that I was truly jealous of the people of New York City, wishing that I also lived in (or close enough to get to Eataly) in the City. To start, the market is incredible. 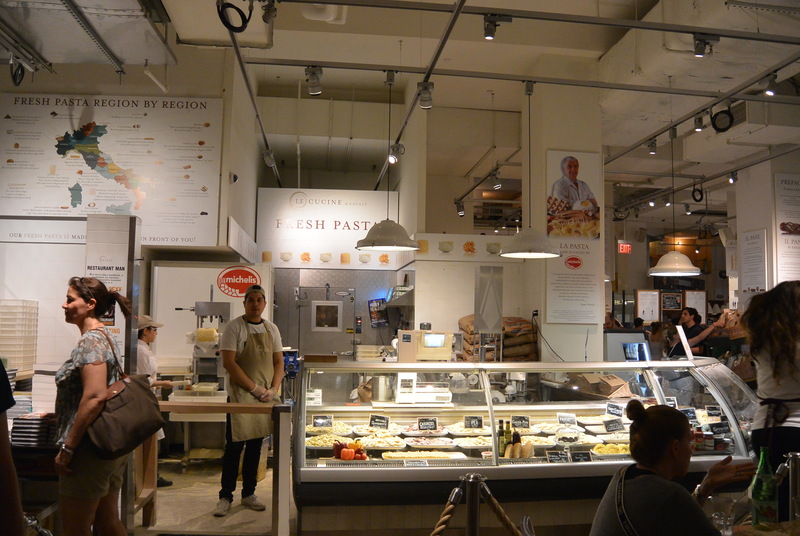 Fresh pasta by the pound, amazing seafood, cooking utensils and endless ingredients for you to peruse through. I definitely felt that I could spend a whole day in there, reading about every type of pasta I could bring home. Sadly, I couldn’t do so, but maybe next time. We decided to situate ourselves in the pasta section after what felt like forever of going back and forth between deciding where to eat. It was a 25 minute wait, so I did end up buying some black truffle as souvenirs since they were in small enough packaging that I could fit in my suitcase. We had a pasta each. 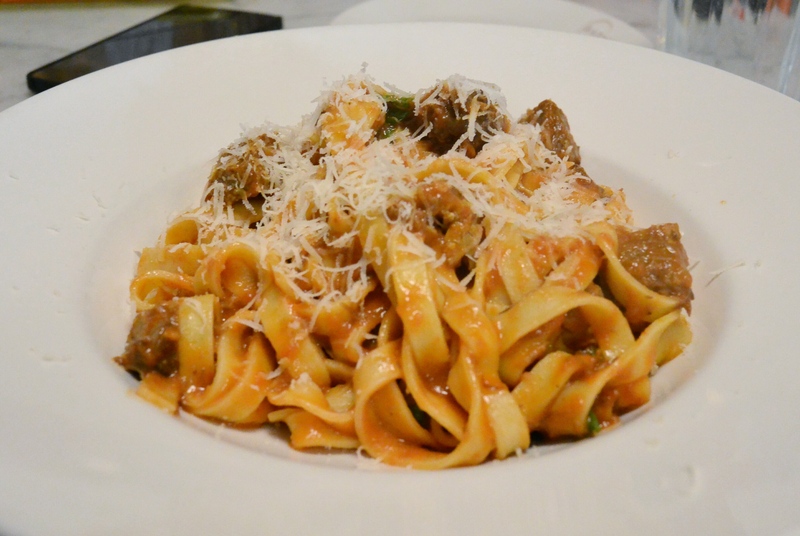 First was the tagliatelle al Ragu di Manzo, which was a short rib ragu with parmesan cheese. Absolutely incredible pasta, the tagliatelle had the bounce and almost slight crunch to it that we love in noodles/pasta. The flavour of the ragu was just right; very slightly spicy, lots of meat flavour in a non-overpowering tomato flavour. Definitely the better of the two. The other pasta we ordered was the Lamb Gnocchi. The gnocchi was a little stickier and more cheesy than I’d like it. 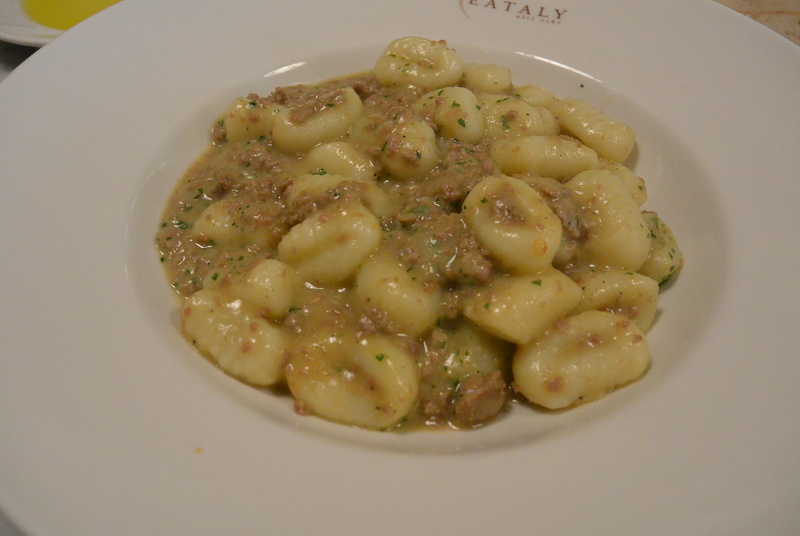 The gnocchi had the heaviness it should have, and paired with the lamb, I thought it was a little too much. As a result, I had to swap with tfung. I’m a little disappointed by this dish for sure, as I do love gnocchi, but it is often not how I like it done. Perhaps I just don’t like traditional gnocchi. There isn’t too much extra flavour from the sauce of the pasta. It just added the moistness that the dish needed. 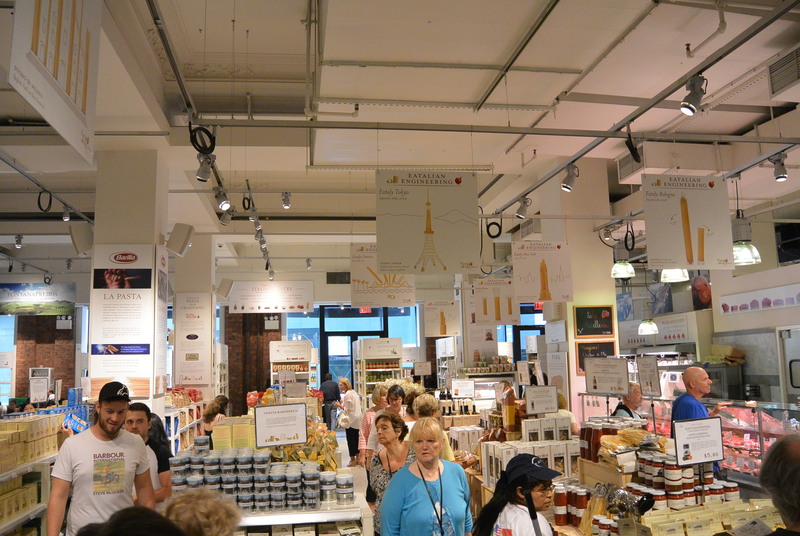 Overall, I definitely think that everyone should go to Eataly and experience the vast and sheer volume of products they offer. It really give syou perspective about how awful commercial supermarkets are in terms of giving you depth of a culture. 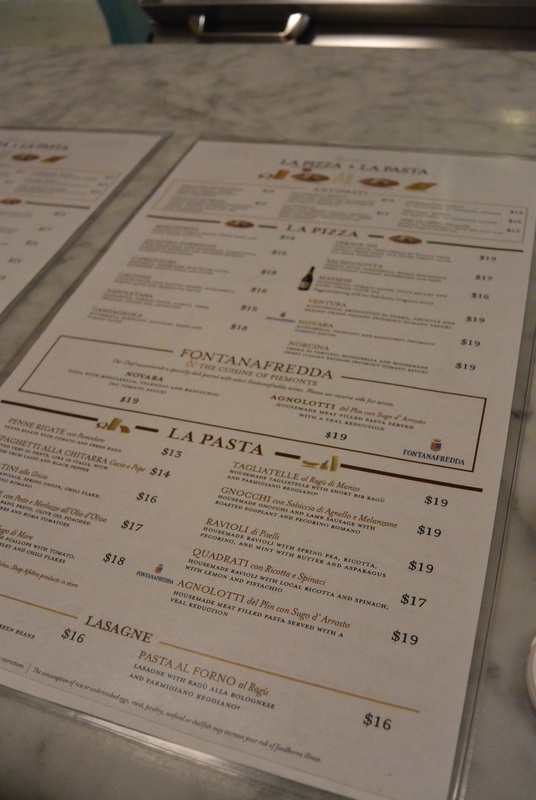 We only tried the fresh pasta, and had mixed feelings about the gnocchi. But next time, I’d definitely try the pizza and the seafood. The only con to the market is that it’s not foodcourt style even though your group may want different things. For example, we wanted one dish of pasta and one dish of fish, but because they were in separate “restaurants”, we were unable to do so. 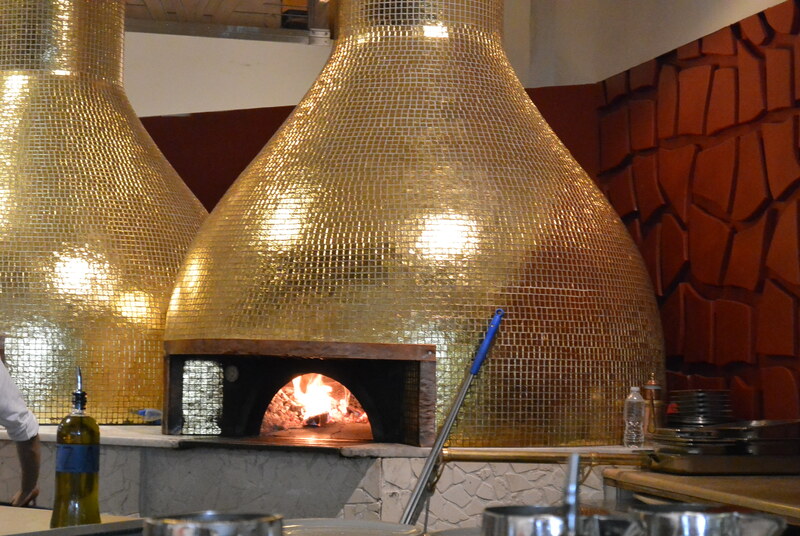 They had a restaurant that serves all types of food, but we wanted to experience the excitement of the open kitchen. I was very lucky to have been able to go to Sushi Nakazawa on the eve of my 24th birthday. Tfung was incredibly sweet to take me, and we were able to book the bar. The bar seats 10 guests, and since they were all pairs, I believe there were 5 reservations made at 12am, exactly 30 days prior. This is important when booking: make sure you have fast internet connection, and you have the windows open at around 11:50pm to wait for the 12:00am mark! We were promptly seated when we walked in (even though we were embarrassingly 7 minutes late). Luckily, there were a fair few couples that had not showed up yet, so I felt a little more at ease. To be seated, we were told to climb up onto the high chair and then the hostess had to physically push us in while on the chair, due to the design of the bar. They are very nice about it, though I did find it a little annoying if you had to go use the restroom. Already placed were the black lacquer serving plates, chopsticks and two glasses (wine and water). As we sat down, the waitress came around with hot towels, to clean our hands with. She then asked for our choice in water, brought it, and then set down little white plates with a folded wet napkin sitting on it. This was for cleaning the fingers if one chooses to use their hands to eat the sushi. When all the guests were properly seated, Nakazawa greeted each of us with formality, as per tradition. (I revel in this kind of stuff). Then he said we would begin. He explained generally how it works, that the sushi is served as it is to be eaten. There will be 21 pieces, and asked if we were hungry, as it will be filling. He added that if we were starting to feel too full, we can tell him and he would reduce the amount of rice, as everyone is to finish each piece of fish. Then, he started. There were 5 chefs total. Chef Nakazawa, 2 sous chefs (one on either side of him) and 2 assistant chefs. Everyone was well situated into their roles and had no hesitation. The role of the sous chefs were to slice the fish, torch the fish, and to cook the shrimp. The other sous chef was in charge of the plating. Chef Nakazawa puts the sushi together, the fish, the rice, the wasabi and the soy sauce. I was buzzing in my seat from the excitement that is about to unfold. I felt like I didn’t have enough eyes and brain capacity to take in every detail that I wanted to. The chefs had very particular ways of handling their tools. Everything is wiped down and cleaned before commencing the next step. Tools and equipment are always placed in the space they should be filling after each use. Everything is clean, sanitary, and of top quality. 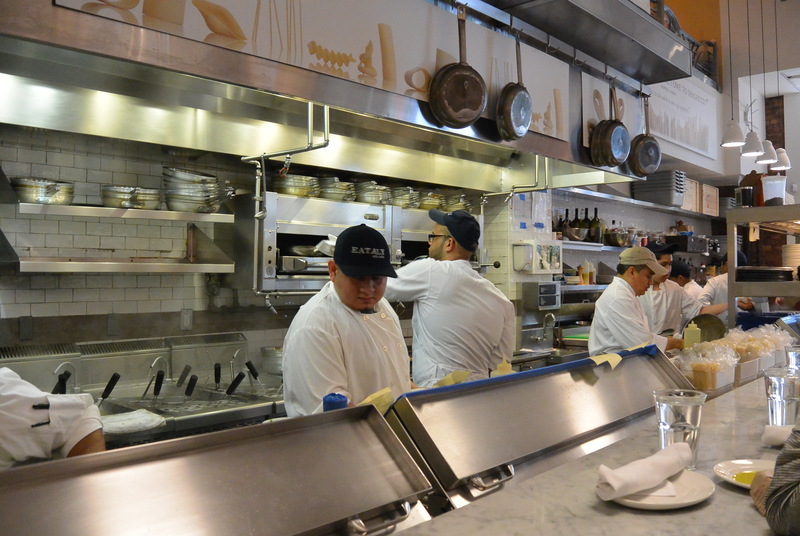 Having taken lots of food safety courses, I often scrutinize restaurants (especially if they have an open kitchen) on their sanitary practices. There was nothing that made me raise a red flag so far. Russian Churu Salmon with salt and yuzu. The experience was amazing. He did not disappoint. From food, to service, to decor, to experience, everything was on point. He explains every fish right before he serves it, even using his Samsung Galaxy Tablet to show us what the fish actually looks like in the ocean (for the less common ones like Trigger fish). He looks like he enjoys what he does, cracks jokes with the clients, creating a different atmosphere and tone each time you visit. Everything is timed perfectly, for example, the cooking of the shrimp. Everyone’s minds are sharp and they know exactly what to do next, without ever losing complete focus on the task at hand. You can tell their minds were not wandering to their hot date tonight or any such trivial matters. Their passion was sushi, and they try their best to create perfect pieces of art. My verdict: if you can afford the hefty price, you should definitely go. It is probably as close you can get to Jiro’s sushi without needing to know too much Japanese. Due to Nakazawa’s fluency in English, there is no language barrier. I will say though, that if you don’t get a bar reservation, it might not be worth your time (especially if you’re from out of town). There is no experience, and the sushi will not be prepared by Nakazawa himself. It is simply just not the same. It was definitely one of my most memorable birthday memories, and I’m so glad to have shared it with someone who loves eating and sushi as much as I do!